When you are born into a family of fishmongers (my grandparents were fishmongers and so was my dad), imagine what the common dishes on the dinner table would be!! I remembered the good old days when my dad will bring back a packet or two of seafood daily for my mum to cook. How fortunate we were then and yet I didn’t appreciate it. Haiz!! In my opinion, the most important thing to take note of when you want to steam fish is to choose and buy the freshest fish you can find. Steaming is great as it is healthier choice. The freshness of the fish head topped with loads of black bean and garlic sauce goes so well with steamed rice. Just one word to describe this dish, “YUMMILICIOUS”!! Hope you will try this recipe and be generous and give us some feedback/comments via our blog. We would also like to welcome you to join our Mummy’s Kitchen Facebook Group for food lovers like you, whether newbie or veteran. You can like us on Beyond Norm’s Facebook Page and subscribe to our blog. Follow us on Instagram and YouTube @beyondnormblog to get the latest updates and videos. 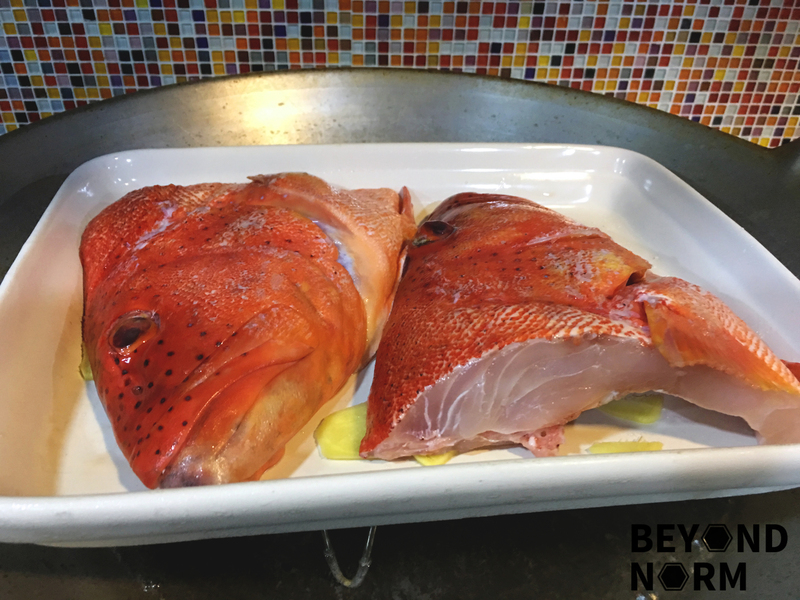 Remove any blood and impurities from the fish head and rinse with clean water. Rub salt on both sides of the fish head and set aside. 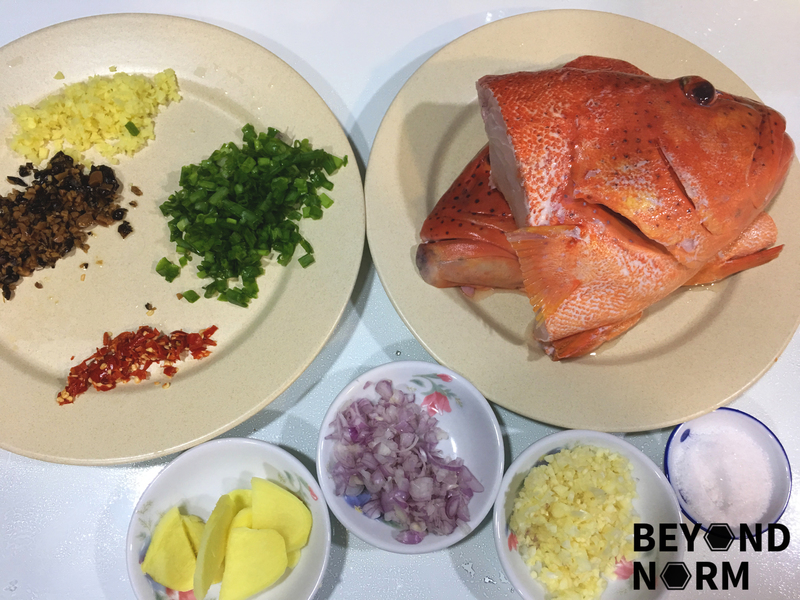 In a heatproof dish, place the ginger slices then place the fish head on top of the ginger slices. In a pan, heat the oil on medium heat. Add the garlic and fry at low heat for ½ a minute. Add the shallots and ginger and fry till fragrant. Add the fermented black beans. Cook the mixture over low heat for 2 minutes then add the Shaoxing wine. Add the liquid from the steam fish, and the spring onions then give it a quick stir. Turn off the heat. Ladle the mixture over the fish head and garnish with coriander and red chilli. Then serve immediately with steamed rice. You may use Carp (Song fish) but personally I am not a fan of freshwater fish, so I used Red Snapper. It is important to clean the fish head before steaming as I prefer to keep the liquid after the steaming.